In this guide you're going to learn everything you wanted to know about maintaining your salt water pool. So, if it’s not maintenance-free, then why the heck would you even want a salt water pool in the first place? Actually, there are some other benefits to salt water pools that may make you want to convert. ​Water in salt water pools feels much softer than water in traditional chlorine pools. Even though your salt water pool will be generating its own chlorine, most people consider it gentler on the pool and the swimmer (source). Salt water pools do not produce those nasty chloramines that traditional chlorine pools produce because they burn them off during their generating process (source). Since the salt water cell produces its own chlorine, you don’t have to handle and store dangerous chemicals. When the settings are properly adjusted, salt water pools produce the right amount of chlorine instead of the pool-owner having to add it. Don’t mistake low maintenance for no maintenance: there are still things you need to do to keep your pool clean and your salt chlorine generator running right at the beginning and end of pool season. Remember: keeping your pool and filters as clean as possible will save you time and money down the road! I always recommend scheduling the same day of the week to do your weekly pool maintenance tasks. That way you don’t forget and it’s easier to stay on top of things! Every week, you should test your pool’s pH and free chlorine levels with a test kit or test strips to make sure your salt cell generator is properly adjusted. You can use a complete testing kit or just buy the testing strips. Your pool’s pH level should be somewhere between 7.2-7.6 and the free chlorine should test between 1.0 and 3.0 ppm. If the chlorine is a little off, you'll need to adjust your chlorine generator accordingly by the output control on the control box or cell. If it’s off a whole lot, you'll probably need to retest every day until it’s back to normal. You can lower free chlorine by dialing back the output setting on your chlorine generator, or run your circulation system for less time. And you can raise free chlorine with super chlorinate (aka pool shock treatment) or increasing chlorine production. If the pH level is off, it can be raised with sodium bicarbonate (baking soda) or lowered with sodium carbonate or muriatic acid. Your monthly tasks are going to be a little bit more involved because you'll be testing and adjusting and balancing chemicals and cleaning a little more thoroughly. You need to check the salinity in your pool water regularly: it should be between 2700-4500 ppm, but each salt cell generator is unique. Always check your manufacturer’s instructions to see what the proper amount of pool salt is for your model. Some generators come with their own control panels that will display the water’s salinity level. But if yours doesn’t, you will need to use a salt meter or testing kit to find out. When your salt levels are too low, you can add salt, but when they’re too high, you will need to dilute the water just like with high CYA levels. Be sure to read your salt cell generator’s manufacturer’s instructions to find out the right amount of salt to add. Adding too much can sometimes cause damage to the unit. Alkalinity works hand-in-hand to keep your pool’s pH levels stabilized. High alkalinity is usually what is responsible for cloudy pool water and low alkalinity can cause corrosion and pool damage. The proper levels are between 80 and 120 ppm. To lower alkalinity, you can add a sodium bisulphate product or muriatic acid. To raise it, add sodium bicarbonate. This process may take a few days as you want to add the chemicals slowly and retest every 24 hours. CYA acts as a stabilizer for your pool water. Don’t overlook this one! A proper CYA stabilizer level is what prevents your pool’s chlorine from being eaten up by UV rays. Your pool can lose up to 90% of its chlorine on a bright sunny day without a stabilizer. Salt water pools require higher amounts of CYA, so they should be kept between 70 and 80 ppm, per most saltwater system manufacturers. You can raise CYA levels simply by adding more of the product, but lowering them is a little trickier. Diluting your pool water is really the only way it can be done, so you'll need to drain a little of it and add fresh water. Or if the level is not too terribly high, you can check in a day or two to see if it corrects itself. Calcium hardness is important to keep balanced because high levels can lead to scaling and low levels to corrosion. The proper calcium hardness level is between 200 - 400 ppm. Lowering calcium levels is tricky, but it can be done. The safest way is to dilute your pool water by draining some out and adding fresh water, but that can get expensive. Another method you can try is using a flocculant. A flocculant will clump together loose calcium deposits making it easier to skim or vacuum out. But if your levels are still too high, you might need to call a professional. Every three months or so, it’s good to inspect your pool’s salt cell to keep it performing well. Your unit will probably be equipped with some sort of alert or light to let you know it’s time, but even if it doesn’t, put it on your calendar. Turn off the power to your salt cell generator and open the unit up and look for any buildup. If you don’t see any or much at all, simply rinse it off and put it back in the unit. If you do see noticeable buildup or scaling, you will need to clean it thoroughly. Sometimes simply using a brush to scrub off the scale and spraying it off with a high-pressure nozzle will do the trick. But if that doesn’t work, you may need to soak it in a mild hydrochloric acid wash.
You should be regularly cleaning out your pool pump, pool filter and skimmer, but this is also a good time to do a more thorough job. A good test kit for salt water pools should be able to test chlorine, pH, alkalinity, calcium hardness and stabilizer (CYA). 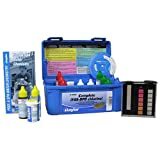 This kit from Taylor Technologies will test everything you need in order to keep your salt water pool chemistry balanced. All their kits come with thorough instructions so they take all the guesswork out of testing your pool. All salt water units are different, so keep this in mind when you're winterizing it. Some manufacturers say you must drain all the water out and some say it’s okay to leave a little water in with some antifreeze. But if your unit is easily removable, it’s usually best to detach it and store it inside out of the winter elements. Just be sure to follow the instructions for your particular unit. 1. How do I add salt to my pool for the first time? Check your owner’s manual for the proper salt level for your salt water chlorinator. Test your pool’s salt level with your test kit. Calculate the proper amount of salt to add. Either distribute the salt all around the edges of your pool or broadcast it into the shallow end to be circulated by your pool’s pump system. 2. Can you put chlorine tablets in a salt water pool? A lot of pool owners ask about this as a way to raise chlorine levels quickly. Yes, it is fine to add chlorine tablets to your salt water pool, but I wouldn’t do it often if you want to avoid chloramines. 3. How do you clean a salt water pool that is green? Most salt cell generators have a “super-chlorination” switch that is great for adding a little extra boost of chlorine, but you shouldn’t use it as a replacement for shocking your pool regularly. If your pool is green, you'll need to shock it, maybe even more than once, just as you would a regular pool. 4. Does algae grow in salt water pools? Yes. Just like any pool, if the water chemistry levels are unbalanced, you always have the possibility of algae blooming and growing. 5. How do you clear a cloudy salt water pool fast? First, you'll need to determine what caused your pool to cloud up. It is usually a problem with the circulation, unbalanced chemistry or algae. 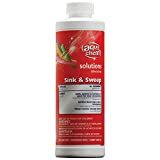 If it’s unbalanced chemicals, the fastest way to clear it up is to balance those. If your chemicals seem balanced, check your filtration system. You may need to clean out your filter. If it’s algae or some other contaminant, you can use a pool clarifier and vacuum up the residue. 6. Are salt water pools cheaper? Salt water pools actually are cheaper to operate. The yearly chemical cost for a salt water pool is about $70-100 versus chlorine pool costs that run about $300-800. 7. How long after adding salt to a pool can you swim? You should always wait at least 20 minutes before swimming in a pool you have added salt to so that it has time to dissolve and circulate. Salt water pools can be a great addition to any home and they are usually cheaper and a little easier to maintain. Just make sure you keep your chemicals balanced and your generator clean and you will be enjoying your new addition for many years to come!